Dakine No zone has is the appropriate headgear with which you can enjoy the sun completely. Above all, he is the best protection kiting and surfing on the water and the slopes on the beach. The sporty sun hat floating on the water, do not go under and dries very quickly. 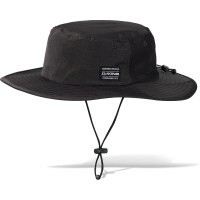 Australian bush hat from Dakine with a solid line to fold up and fix. Customer evaluation for "Dakine No Zone Hat Hat Grey"